Last night I was at Pivovarsky Dum for the tasting session with Pivovar Kocour Varnsdorf, where they presented 6 of their beers, most of which I had tried in Plzen at the Slunce ve Skle festival. However, I was looking forward to trying their 12 degree lager and Scottish Ale as well as re-trying their stout, which I had at Slunce ve Skle but by that point the note book was in my pocket and I was focusing on drinking. The first offering was their unfiltered and unpasteurized 12 degree lager, which is a pale golden colour, Mrs Velkyal noted that it looked like sunflower honey, with a nice slightly off-white head. On the nose there was a touch of smokiness that put me in mind of the wonderful Schlenkerla Helles lager, as well as some cidery notes. Again like the Schlenkerla, the lager has a nice, crisp clean flavour, and the the first few mouthfuls are refreshing, although I found the body a bit thin for my tastes, even watery after a while. I found this to be quite bitter, with a low level of sweetness in the background. I was really looking forward to the Scottish Ale as it would be a taste of home. The beer itself was brewed by a Scotsman who came over to make it. It pours a light brown, which put me in mind of McEwan's 70/- and had a smallish head which was a slightly darker ivory. There was very little on the nose, Mrs Velkyal commented that she didn't like what she could smell, and I thought it smelled like cigarettes. However, it tasted quite good, with a light caramel flavour, the only problem from my perspective was that is was a touch too bitter for a Scottish Ale and I would have liked to see more body and a fuller sweetness in the beer. The highlight of the night for me was the stout. This stout is jet black and comes with a fantastic foamy brown head. The nose is full of roasted coffee and made me think of a fine Italian espresso, just wonderful. In the mouth it is smooth with the coffee notes balanced by a nice touch of chocolate and even a certain creaminess. The body was a little on the light side, which I actually found helped the drinkability of this beer. With a touch more sweetness than bitterness this is a beer I could merrily drink lots of - and the sooner it is a regular on the taps of Prague the better. One of the things I really enjoyed about last night was comparing beers with Mrs Velkyal, it is said that women have better palates than men and so to get her input was interesting - for example with the stout, where I was enjoying the roasted coffee she thougt it teetered on the edge of burnt rather than roast. It was also a pleasure to finally meet Evan Rail, as well as seeing Honza from the brewery itself again. So a few hours with people who love their beer made it a throughly pleasant evening. I decided over the weekend to continue my beer in food experimentation, as well as to jump of the beer hacking bandwagon, as suggested by Evan Rail. Thus it was that on Friday afternoon I decided to make a "Christmas Stout" and even some beer toffee. My original plan involved buying 4 bottles of Kelt, Czech stout made by InBev's subsidiary here, Pražské Pivovary - probably better known as the maker of Staropramen - for the beer hacking and a bottle of Hobgoblin for the beer toffee. My plans were immediately put to the test by the fact that when Mrs Velkyal and I went to the Cider Club to buy the Hobgoblin, I ended up spending all the spare change I had in my pocket on 2 bottles of Hobgoblin, a bottle of Black Wych stout and a bottle of Wych Craft, not to mention Mrs Velkyal's raspberry flavoured cider. At least I had the Hobgoblin, which immediately went into the little cellar in preparation for making toffee. Buying the Kelt was no problem whatsoever as my local Billa sells it. Let the head dissipate before capping and forgetting about it for 2 months. So yes, there is now a litre of stout infusing with the classic flavours of Christmas and hopefully preparing a lovely treat for December. So my thinking was to use a 330ml bottle of beer, and increase the sugar accordingly - giving me 1kg of sugar, and a slightly bigger pinch of cream of tartar. The sugar dissolved nicely into the beer, however I think the pan I was using was too small as I couldn't keep the mixture on a rolling boil for fear of the sticky goo overflowing and making a right mess of the cooker. The original recipe calls for 20 minutes worth of boiling and then putting the mix in a greased tin to set, at the moment I think I have created a beer caramel sauce which will go quite nicely on top of ice cream. If there are any toffee makers out there, I would appreciate some advice on what went wrong - I have a feeling that the size of the pan played a major role, but our big pan was full of a curried cream of roast butternut squash soup I had made on Saturday. So 1 unknown quantity in the beer hacking, and something of a dismal failure on the beer toffee front, however, I will not be deterred. Update: As you can see I have added pictures the weekend's fun - couldn't do it yesterday as I forgot the transfer cable at home. Having raved about their beers earlier in the week, I think there can be no better Beer Hero of the Week than a company that not only makes wonderful beers, but also flies in the face of the mass market and produces ales in the Czech Republic. Every so often I feel the need to not drink for a little while, usually a week or so. I do this because in the last 18 months I have gone from being Much-Too-Velky Al to my present incarnation of just Velky Al. Compared to this time 2 years ago I am about 50lbs lighter (that's almost 23kg for our metric friends), and I have no ambition to go back to the state I was in then. It was also around this time that I got fed up with drinking vast qualities of industrial lager, so I adopted a new healthy eating regime, took a bit more exercise and for 6 straight months didn't touch beer at all. My first beer after the 6 months were up was a Samuel Adams Boston Lager, which I had in Columbia, South Carolina after flying there with Mrs Velkyal to spend 5 weeks visiting her family in the States. It was nectar, not just because I hadn't had a beer in so long, not just because the flight had been long and boring - and our bags were delayed because of the terrorist attack on Glasgow Airport - it also happened to be a damned fine pint. So this week in the wake of Slunce ve Skle I decided to take another of my weeks off and not drink again until Monday's tasting of Kocour ales at Pivovarský Dům. I think these weeks off also help to heighten my appreciation of the beers I drink, and make me want to value each beer rather than chucking some swill down my throat on a Friday night to get drunk. That is, I think, my paradox - I drink far less than I used to, but drink far better than I ever have. Yes I am looking forward to having some IPA on Monday, and when you live in the Czech Republic any opportunity to have IPA must be grasped, but I have enjoyed my week on the wagon. In a couple of weeks I am going to Bicester in Oxfordshire as Mrs Velkyal has a conference to attend in Oxford, and I fancied a jolly. Being a good and dutiful husband I having been looking for restaurants and the like to eat in during the days when we are in Oxford itself, the reason we are staying in Bicester is that my brother lives there and we can combine the conference with seeing some family. Being a good and dutiful drinker of beers, I have have been looking for pubs that serve real ales and traditional British food, this is also good for Mrs Velkyal as she can discover the delights of steak and ale pie, chicken in a basket and fish n' chips - honestly this is for her benefit and not to satisfy my cravings for British food. Anyway, back on track - in the course of my searchings I have been reading a lot about the brewers in Oxfordshire and the surrounding counties, several of which I have made mental notes to try when I am there. 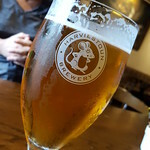 One of the brewers I came across was Everards, who brew in Leicestershire but have a single pub in the centre of Oxford. One thing that I found particularly interesting about Everards is that they created the Cyclops Tasting Notes, which you can see below - this one describing Everards Tiger Best Bitter. Although I have been drinking beer for nearly 15 years now, it is only in the last 3 that I have started to drink craft beers and I have to admit that sometimes I try a beer and wonder what am I supposed to be smelling and tasting - while it may taste great to me, is it what the brewer intended? That is really a secondary question, because if it tastes great then I don't give two hoots what the brewer wanted to do, what he did was good. Being something of an anorak - I guess hunting out pubs wherever you go is the beer drinker's equivalent of standing on the platform of Crewe railway station on a wet Wednesday in October videoing trains coming and going (I have seen it done!) 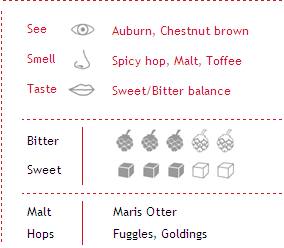 - I love the fact that Cyclops lists the primary malts and hops which have gone into the beer. It is more than knowing what I am drinking, it is learning to recognise the flavours of the ingredients in the beer, thus making me more knowledgable. As I am a number 5 according to the Enneagram of Personality, this is hardly surprising - I am just thankful it is beer and brewing I am fascinated with rather than the glue on the back of a stamp. From the Cyclops description of the Tiger Best Bitter I am looking forward to hunting down the Royal Blenheim and having a swift pint. I would love to see Czech brewers adopting this system as a way of educating drinkers here. Beers from the Czech lands have been synonymous with bottom fermenting lagers for over 150 years. In common with most of Europe though, ales would have been the dominant form of beer prior to 1842 and Josef Groll’s Pilsner Urquell. Recent years however have seen a number of microbreweries experimenting with styles of beer more commonly associated with Britain and Ireland. The Primátor brewery in Náchod produces English Pale Ale, which is very well regarded, in particular by Mrs Velkyal. However a new brewery has come of the scene making a wider range of ales, including stout and IPA, that new brewery is so young they don’t even have a website up and running yet, Pivovar Kocour Varnsdorf. Whilst it is true that I like lager, I am by far a bigger fan of ales. There is more complexity, a wider range of styles and flavours to enjoy, so for a brewery to making ales in the Czech Republic is cause for hunting them out and trying them. I was very happy though to see that Kocour had their wonderful V3 Rauchmalt Special. This exceptional beer is dark brown with a creamy tan head, and the first impression I got on the nose was sausages barbecuing over an open fire – which actually was happening just a few feet away so I wandered off to find Mrs Velkyal on the over side of the courtyard to make sure. Many other rauch beers have an overwhelming flavour of ham, and V3 is no different, however the hamminess (is that a word?) is smoothed over by a sweet wine touch with also contributes to the full body of the beer. While I was enjoying the V3, Mrs Velkyal decided to try Kocour’s American style Pale Ale - using Centennial hops - which is decidedly paler than the almost red Primátor product. I only sampled a mouthful or two of her beer and didn’t take any notes so I have to rely on Mrs Velkyal’s opinion which was simply “Primátor has competition”. I have to admit I love Mrs Velkyal’s approach to beer, it is much more down to earth than my near obsessive reading and experimenting, so when she enjoys a beer it must be worth further investigation – which will take place on Monday at the Kocour tasting session in Prague’s Pivovarský Dům. At one point during the proceedings, Pivní Filosof and I got talking with Honza Kočka, the owner of Kocour, who told us that he is planning a rauch porter and other ales are in the pipeline. Excited? Me? Pivní Filosof? Erm I think so. Honza also told us that once the American Pale Ale was done with they would be tapping their India Pale Ale. Cue encouraging Mrs Velkyal to drink more. With the APA was done, we moved on the to IPA, and what a taste explosion that was! The beer pours beautiful amber with very distinct orange tints although there was very little head. The nose was very hoppy, very hoppy indeed – lots of grass and floral notes. This is a good bitter IPA, which was almost like drinking a Seville orange – bitter and touched with sweetness as well. Usually Mrs Velkyal shies away from IPA as she is not a big fan of bitter beers, but she enjoyed this one very much, remarking that she had a Goldilocks moment with this IPA – finding one where the bitterness was “just right”. The last of the Kocour ales on tap was their stout. As I have recorded elsewhere I am a big fan of this beer style, and Kocour’s is a very good example. This pours beautifully dark, with a dark beige head and masses of chocolatey coffee on the nose, and smooth in the mouth. Thick and filling as a good stout should be, this was a wonderful beer deserving of a far wider distribution. I got to this beer late on in the day and it is another one I am looking forward to properly evaluating on Monday, hopefully drawn out of Pivovarský Dům's hand pump. Having only started production in the last year or so, the future augurs very well for Pivovar Koucour Varnsdorf. Here’s hoping that this is not only the beginning of a very successful business making great beers but also the beginning of drinkers in the Czech Republic having the opportunity to experience more than just lager. Thanks to my very good friend Raimonda for sending me this, makes interesting reading and viewing. I came to Plzeň with a very definite plan in mind; stage one, drink Purkmistr beers on the Friday night; stage two, drink the others on the Saturday and try everything available; stage three, have enough material to write at least five blog entries. Stage one was an abject failure, for reasons I mentioned yesterday, i.e. they had different beers than were available in their pub on the Friday night. Stage two was reasonably successful, I enjoyed beers from at least 5 of the other brewers attending the event, and one brewer in particular has found a special place in my beer drinking soul. One of the most challenging things of Saturday was writing down my notes about each beer, it was somewhat chilly and looking back at my scribblings, some of them are indecipherable. Anyway here are my assorted highlights, leaving aside Pivovar Kocour Varnsdorf, which we will deal with tomorrow. First up was the "Staročeské bilé pivo" from the Pivovrek Velký Rybnik, bilé pivo here means wheat beer and it was actually rather nice to see them using the old name for wheat beer – once upon a time wheat beers were “white” and barley beers were “red”. The beer itself was very reminiscent of the German style wheats I have learnt to thoroughly enjoy over the last year or so. It poured a cloudy dark yellow with a nice white head, the nose was clearly citrusy, which carried over in the first mouthful, tart and refreshing – it would have be perfect on a sunny day, which unfortunately Saturday wasn’t. One of the brewers I was particularly keen to try out was Kout na Šumavě, which Evan Rail has waxed lyrical about over on Beer Culture. They had three beers on offer, and so I plumped for their filtered 12° lager, and a very nice chat with I assume the owner. I am sure the virtues of Kout na Šumavě have been extolled in many places, but this for me was as close to Bohemian lager perfection as I have ever experienced, pouring a dark golden with a tight rocky head. In the mouth it was sheer lager delight, I am not sure I have enjoyed a pint of bottom-fermented beer so much for a long time. Pivní Filosof had told me that this was a good beer, and boy was he right – for anyone who thinks that lager is pale and insipid this stuff should be made compulsory drinking. Next on my list of notes is a 13° dark lager from Železná Ruda, a very dark beer which had a light tan head that never fully disappeared. Sticking my nose into the glass, having bought a nice 0.3l Purkmistr glass specially, the overwhelming aroma was Italian roasted coffee, which was complemented in the mouth by the gentlest chocolate flavour, which made the beer very smooth in the mouth and a very satisfying drink. One of the highlights of the day though was a 14° wheat beer from U Rybiček in Střibro. Unlike the Velký Rybnik wheat, this one came served with a slice of lemon chucked in the top. When I got back to our table, where myself and Pivní Filosof were happily swapping beers and making notes, one of the Czech guys at our table was horrified at the sight of the lemon floating in the beer. Even with allowing for the lemon, this had a sweet citrus nose, which reminded me of thick cut orange marmalade, a fact which was backed up by the taste. Again a refreshing wheat beer, but being stronger than others I have tried was more filling. As a result of these various tastings I will be wandering around the Czech Republic to try out the rest of these brewers beers, in particular I am looking forward to getting down to Kout na Šumavě and enjoying copious amounts of their 12°. One thing that constantly came to mind on Saturday was the fact that Czechs make wonderful beers, yet the vast majority of Czechs are convinced that mega-brands like Gambrinus and Staropramen are fantastic. So entrenched is this brand loyalty that at the festival one of the guys at our table was almost feverish in his claims that while the beers available were good, they were not as good as Pilsner Urquell. Yes Czechs make great beer, but the mega brands are not among them and the wider audience the smaller brewers can attract the better. After all, is this not one of the key tenets of capitalism, that competitions improves consumer choice? But consumer choice is worthless without consumer education. As I wrote about on Friday, I spent this weekend in Plzeň so that Mrs Velkyal and I could go to an event called Slunce ve Skle, a microbrew festival whose title translates as "Sunshine in a Glass". Although the event itself was on Saturday, we went on Friday night and stayed in the Purkmistr Hotel and Brewery. My plan was to try all the Purkmistr beers on the Friday night, leaving Saturday free to enjoy the offerings from the other brewers. So Friday night Mrs Velkyal and I enjoyed a very nice dinner, both of us are fans of fried cheese – on Friday I had fried Niva, a type of blue cheese. All the Purkmistr beers I tried on Friday night were 12° and I tried the pale lager, amber lager and the dark lager – all three of which are wonderful beers. 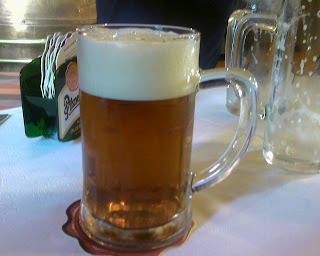 First up was the pale lager, svetlé in Czech, which pours a beautiful golden and has a bright white head. In a country where practically every brewery makes a 12° light lager it is rather easy to become blasé about it. This one however was very nice, with a slight bitterness which makes it a very refreshing and easy to drink lager, in fact I could quite believe that it is too easy to drink – especially as I polished off 5 half liters of the stuff over the course of the next few hours. Next up was the amber lager, polotmavé in Czech, which is slightly more red than amber and crowned with a tight ivory head, making smelling anything coming from the beer a near impossibility. I have become a fan of polotmavé in recent months, primarily due to the excellent 13° made by Primator, well the Purkmistr version is better. That is not to take anything away from Primator’s beer, but this one is very smooth and has a wonderful sweet maltiness offset by a gentle hoppiness. In common with the pale lager, this is a very easy beer to drink, and every drop is a pleasure. Purkmistr’s dark beer, černé or tmavé in Czech, is very dark – sometimes dark lagers can be watery looking, but this one looked solid and had hints of burgundy and a tan head. There is a distinct hint of coffee on the nose, which is backed up in the drinking. The coffee though is not overpowering and in the background is the merest hint of cocoa. The body is not as full and strong as some over Czech dark lagers, but it is still a filling beer – ideal for a nightcap. On Saturday itself came the Purkmistr guys also had a couple of specialty beers available, a blueberry beer, and a rauchbier, it also became clear that the weather had no intention of living up to the festival name, it was cold and grey - perfect weather for grilled suasages with the beer! The rauch pours a beautiful deep garnet colour and has a light tan head, which stops any hint of the smoked malt aromas from escaping from the beer, the touches that do manage to get out are very light. In the mouth however the smoke is far more pronounced, although nowhere near as in your face as a Schlenkerla Märzen for example, and it does catch in the back of your throat. This is an excellent rauchbier, but not one that I would want to drink for a full session. The blueberry beer, borůvkové in Czech was also very nice, red in colour and with a tinge of pink in the head, the nose was fruity but not in an overpowering sense, and in the mouth the blueberries were clearly to the fore, but without being so sweet that it became sickly. All the Purkmistr beers were very good, and the hotel itself is beautiful and well worth shelling out to stay there. The event itself was excellent as well and in the coming days I will talk more about the various beers we tried, when I say we I don’t just mean Mrs Velkyal and I. We had the pleasure to meet Pivní Filosof, whose blog is an excellent read and heartily recommended. With the various friends we had persuaded to make the arduous trip out to Plzeň (some expats in Prague get vertigo if they leave the city centre), we ended up with a cosmpolitan group of a few Brits, a smattering of Americans, a Norwegian, a Venezuelan, an Argentine and a couple of Czechs. All of us enjoying superb beers and having a wonderful time – the more events like this that take place in the Czech Republic the better. As I bimbled about on the internet on Monday, I came across the Wadworth Brewery in Wiltshire. I was immediately drawn to the tab on the menu bar for "Shire Horses". Being something of a fan of doing things in the traditional manner, and keeping alive old fashioned things I have to admit a liking for the idea of beer being delivered on a dray pulled by a team of Clydesdale horses, although I guess in England Shires would have to do! Thus I wondered which other breweries regularly delivered their beer to pubs using a horse and dray, as well as employing horsemen. I came across just the one other, feel free to correct me if I wrong here. Wadworth Brewery and Hook Norton Brewery. I have been looking forward to this weekend for a few weeks now, ever since Evan Rail over at Beer Culture posted that there would be a beer festival in Plzeň this weekend. The thing that attracted me most was that this wasn't one of the big brand fests with music and the like which seem to be de rigeur for the major breweries in the Czech Republic these days. Also there was plenty of notice, I would have loved to get down to Moravia for the Štramberk event but I found out about it too late - such a shame as I think their dark beer is the best dark I have had in this country. The thought of trying beers from 14 small breweries and brewpubs was just too good a thought to put off, so I contacted a few friends and arranged for a group of about 5 of us to go down - at the moment it looks like me, Mrs Velkyal and 3 others. The venue for the event is Hotel Purkmistr, a hotel which also happens to make its own beer, oh such a shame! I knew that there would be no chance of me wanting to come back to Prague after an afternoon enjoying various beers, so I decided to look into finding a reasonably priced hotel in the area. The company I work for has a benefits system which gives us 12000CZK a year to spend on cultural activities and the like, and so I looked into the system to see what hotels were available on it in Plzeň. You can imagine my joy when I discovered that Hotel Purkmistr was on the system. Two nights duly booked in the hotel and all set for a weekend in the home of Pilsner, although as the hotel's website says Plzeň equals beer but beer in Plzeň is more than just Urquell - and I am fairly sure they don't mean Gambrinus. My plan of attack for the festival is simple, try all the Purkmistr beers tonight in the hotel bar whilst bowling with Mrs Velkyal, then attempt to try every beer available tomorrow - perhaps buying bottles if there are any available to try on Sunday and in the coming weeks. Working on the theory that each brewer has at least 2 brews a piece and 13 brewers makes 26 beers. Back in my hard drinking days I would have polished 26 half litres of beer off without the barest flicker of an eyelid, and if the company I was in was right would have moved on to demi-sec sparkling wine in a club, but I know better now. I am not only excited about the many beers I am looking forward to trying, I am also hoping to meet with some of the writers of various blogs I read, and maybe some of the brewers themselves. Although the biggest thing that excites me, I bow my head in shame at this, but it willl be my first trip to Plzeň, so the camera will get a thorough workout. Here's to a good weekend. My little cellar sits forlorn and empty at the moment, and my mind is wondering what to re-fill it with. That is because I pulled out the final bottle of Rochefort, the 10, last night. So far the Rochefort ales have been something of a revelation to me, I thoroughly enjoyed the 6, was blown away by the 8 and was eagerly anticipating the 10. The 10 pours an exceptionally dark brown, which in a backlight has tints of ruby, topped with a light tan head that disappears fairly quickly. The nose of Rochefort 10 is at first very sweet, as is to be expected for a beer of 11.3% abv, with coffee and even banana notes. At one point I stuck my nose right into the glass and inhaled deeply, and while it took me four or five breaths to really work out the smell, it was a distinct tinge of nail polish remover. I asked Mrs Velkyal to see what she made of it, and she came back saying that it smelled of alcohol laced with molasses. Drinking the ale was a delight, and I found it smoother than the Rochefort 8 yet with the same chocolate and cocoa flavours. Being so dark and full, the 10 is a very rich beer, and definitely not a beer that you would want to be drinking as though it was a run of the mill lager. Despite the smoothness of the beer, there is also a slight touch of bitterness adding a nice counterpoint to the sweetness, like burnt caramel. In the final taste though there was a distinct alcohol taste. All three of the Rochefort ales are superb and I have enjoyed trying each of them, however I have to admit that the one that will be a regular visitor to my little cellar will be the 8. Of the three I prefer the slightly rougher edge that the 8 has when compared to the 10, as well as the richer cocoa flavours than the 6. So know I plan to move on to other Trappist ales, depending of course on what is available in the cheese shop – I still love the eccentricity of being able to buy beer in a cheese shop, not only that but they have a reasonable selection of wines too. One of my favourite subjects at university was hermeneutics – the study of texts and how they function, in fact one of the questions in my final year exam in hermeneutics was “what is a text?” Probably the most important word in hermeneutics is “context”, the environment from which a text is born, to which it addresses itself and the world in which the reader interprets that text. Now, I am not attempting to claim that beer is a form of hermeneutics – although I think that it would actually be quite simple to do so, especially with regard to the hermeneutical circle – essentially that you can only understand the whole text by understanding the parts, and that a proper understanding of the parts is possible only by understanding the whole. What came to mind yesterday was that the context in which you sample a beer has an inevitable influence on your opinion of said beer. Once again I find myself committing heresy by admitting to not being a big fan of Pilsner Urquell, the original and in many people’s minds still the best lager on the planet. In my early beer drinking days I found it too hoppy and bitter to enjoy as a regular drink. As a result of this I preferred its next door neighbour, Gambrinus, or Kozel, which eventually became just another brand in the SABMiller stable. Since I have become something of a paradox in that I drink far less now that I used to when I was in my 20s but now I drink far better, I have started to respect Plzeň’s contribution to world merriment and joy, and it is no longer heard of that I won’t drink the stuff – actually in the right circumstances I quite enjoy it. The pub we went to was one his locals, called Bruska, which has Pilsner on tap from a tank rather than from a keg. The first thing that struck me about the pint when it came was that it was slightly colder than usual, which was a benefit as it was smoother going down. Also the beer held its head better, I am a fan of head on my lager and so when it just vanishes just as the waitress is leaving the table I worry that I won’t be enjoying my pint. So while the taste was the same, the drinking was better. Such is the value of a good pub, while not wanting to denigrate the value of skilled barstaff, it is the care with which a bar treats the beer that has become something of a passion for me. Lines being cleaned and beer being stored at the right temperature have become important considerations, so that while I might not drink more than 5 beers in an evening, I want each one of them to be enjoyable. So it was I enjoyed three quick pints with a friend, in a typical Czech pub - something which I for one hope never dies out in Prague, or worse becomes a cliche of itself. A few weeks ago I made some chilli chutney, using a recipe from a Jamie Oliver book given to me last Christmas. When I do my cooking I like to experiment and play with flavours. For example, the original chutney called for red chillies, so I upgraded those to habeneros which resulted in a very spicy chutney, with a lovely smooth sweetness that rounded it out nicely. Most of the liquid in the original comes from the balsamic vinegar, and it was this I wanted to change, and replace it with some kind of beer. The decision as to which beer to use was a difficult one, did I want lager or ale, hoppy bitterness or malty sweetness? Then I remembered the night Mrs Velkyal and I had our first, and to date only, bottle of Primator Double 24° - a dark beer of incredible smoothness and sweetness with an alcohol content not far off that of wine, 10.5%. Despite the immense sweetness, it also has a touch of bitterness that I wanted in the final chutney. The night we drank the bottle of Double, both Mrs Velkyal and I passed out about 15 minutes after drinking it – a fact we put down to the beer. I let the chutney sit for about a week before tasting it properly, however I did have a few tries while it was cooking and it seems to have worked like a dream. Once the week is up and all the flavours have come together in the jars, I hope to have a sweet yet spicy chutney which will go wonderfully with cheddar cheese on rough oatcakes. Each year, on the second weekend in September, the small town of Beroun hosts a ceramics festival. Being just over 30km from Prague, Mrs Velkyal and I decided to spend the best part of our Sunday wandering around stalls perusing the wares of various potters, while eating freshly made doughnuts. What I wasn't expecting was to have a beer revelation. The centre of the square had a large tent selling Gambrinus and hot dogs by the dozen, out on the fringes though we came across a tiny stall selling beer from the Minipivovar Žamberk, which sells under the brand name Žamberecký Kanec - "kanec" means wild boar. On tap yesterday was a kvasnicové beer - which has fresh yeast added to it after lagering and which Mrs Velkyal enjoyed very much - and to my delight an imperial stout. Both Mrs Velkyal and I speak Czech well enough that we can get by with most things we want to do, but obviously we don't speak Czech to each other, and it was the fact that we were speaking English to each other that we found out about the stout. To begin with I just ordered a kvasnicové beer, turning to Mrs Velkyal to ask if she also wanted a pint - at which point the owner of the brewery (I am assuming there) asked if she would like to try their "dark beer", when he went on to describe the beer and I heard the phrase "in the style of stout" I took an executive decision and gave the kvasnicové to Mrs Velkyal and had myself the stout - I love it when a snap decision reaps such fantastic rewards. The Czech Republic is known quite rightly as being the home of golden lagers, but there seems to be a growing trend toward, or should that be back to, ales. Pivovar Kocour Varnsdorf make some excellent ales, and the Kanec Imperial Stout was in my opinion a wonderful pint, and at 5.5%ABV not as alcoholic as some imperial stouts. As you can see from the picture, this is a very dark stout with a smallish light tan head - a thing of beauty in my book. The nose was full of coffee and in the mouth it was quite bitter but with enough maltiness to keep it from being overpowering, and thus the rest of the pint is smooth and thick and filling, almost like a strong coffee tiramisu. I was in half a mind to buy a bottle of water, ditch the water and ask them to fill the bottle with the stout, yes it was that good. I am fairly sure that before Mrs Velkyal and I leave the Czech Republic we will be paying a visit to Žamberk to try the other beers they have on offer. Thus we wandered around the festival a bit more, looked at solid clay racoons and decided it was time to eat and being fans of traditional Czech and Slovak food we decided to have halušky, and by happy chance the halušky stand was next to the stall for Minipivovar Žamberk and so I did what any self respecting beer lover would do and had another pint of stout, and had a chat with the brewery owner, who seemed to be a real beer euthusiast who wants to make proper beers rather than using chemicals and other such additivies. Looking at the ingredients list on the label he gave me his beer sticks to the basics of brewing beer: water, malt, hops and yeast. Unfortunately not all my beer discoveries yesterday were so pleasant. There was also a van selling beer from the Pivovar Berounský Medvěd - the Beroun Bear Brewery. In the interests of science and having heard that their beer wasn't anything to write home about, I decided I would try their 11º lager. Perhaps it was an unwise choice after three very filling and tasty stouts, perhaps it was also the fact that it was sold by a surly barmaid who seemed to show no interest in the beer itself, but this stuff did absolutely nothing for me. The beer was thin and had a distinctly funky flavour that reminded me of my old nemesis Klašter, I have to admit I ended up chucking most of this one away, I just didn't want to drink it after I had downed about a third of a pint - it was that bad. Having said that though, the outstanding memory of our trip to Beroun will be the fabulous Žamberecký Kanec Imperial Stout, and hopefully we'll being seeing Žamberk beers in Prague more often. And with my ideas for using beer in my cooking I plan to buy some wild boar and make a boar goulash with their stout! This week's Beer Hero is Kimber VanRy. Who? You may ask. Kimber VanRy was enjoying a bottle of beer on his doorstep in Brooklyn and was given a $25 fine for drinking in public. The full story was in the New York Times. The reason he is my Beer Hero of the Week is that when asked if he would be drinking beer on his stoop again, he simply replied: "Absolutely." Congratulations Mr VanRy on being Beer Hero of the Week. Thanks also to Jay for bringing this story to my attention. Last night I went back to Zlý Časy - which literally translates as Evil Times - largley because I was curious to try the corn beer which was advertised on their website. Yes you read that correctly, corn beer. This is one of the products of Pivovarský Dvůr Chýně just outside Prague, which is, according to their website, the first Czech brewpub and is located in former monastery buildings. The beer itself is a pale golden colour with a good thick head, which didn't disappear faster than a politician's morals in the face of potential power. Tastewise it is difficult to really explain, I was hoping that it would taste something like cornbread - Mrs Velkyal being from the South means I have been introduced to all manner of delicious food, biscuits and gravy for breakfast? Yes ma'am! But my expectations were dashed, it tasted like the vast majority of Czech lagers, which is certainly not a bad thing, but I was hoping for something different, maybe even revelatory. It was however a lot smoother than many Czech lagers of a similar strength, it was an 11°. By the end of the glass though I was pondering something different. That something different came from the east of Prague, near Pardubice, to be precise the small town of Medlešice, home to the pivovar of the same name - it was their 12° dark lager. I have become something of a fan of dark lagers over the last year, in particular the offerings from Eggenberg, Chodovar and the absolutely wonderful Štramberk. When I first arrived in the Czech Republic I was told in no uncertain terms by various people, that dark lager was for girls, especially for giving girls large breasts. Anyway, back to the beer, this dark lager is thick, really thick and has a wonderful towering ivory head. It is very smooth with coffee tones, again there was a hint of plum on the nose and in the drinking. I rather enjoyed this beer. Zlý Časy is becoming a favourite place of mine because they have somewhat obscure beers that even places like Pivovarský Klub never, or very rarely, have available. There were another couple of beers on tap last night which I didn't try; the Kacov 10° lager and the Svatý Norbert Weizen which I had tried before. With a selection that changes quite often, this is pub that will be re-visited a lot. A couple of days ago I came across a place selling ales from the Wychwood Brewery in Oxfordshire, available at the time of writing were Wychcraft, Circlemaster, Black Wych and the acclaimed Hobgoblin. Having to run an errand for Mrs Velkyal which put me in the vague general direction of the shop, well ok then I was in the same postal district, I endeavoured to pop by and pick up some treats. Once I had found the shop, cunningly disguised by shared floor space with a comic shop, I bought myself a bottle of each of the aforementioned beers, for just over £5. Happy days. Last night I decided would be a good time to try out my new acquisitions, having taken them from the “little cellar” and bunged them in the fridge to get down to just the right temperature. When I have my little tasting sessions I like to go from the weaker beers all the way through to the stronger – so I started with the 4.5% ABV Wychcraft. The label describes Wychcraft as a blonde beer combining the four elements to “create a truly magical brew”. Wychcraft pours a fantastic amber colour, with a nice head that doesn’t fade too quickly and leaves some slight lacing down the glass. The first thing which hit me was a very citrusy smell, probably from the fact that this is “thrice hopped” – eventually that citrus would define itself more clearly as a combination of grapefruit, lime and marmalade, getting sweeter as time went on. There is a nice refreshing tartness to the beer, and having been hopped three times, hops are clearly at the forefront of both nose and taste. With such a citrus element to the beer it is unsurprisingly zingy on the tongue, although I found it left a slight catch in the back of my throat. In general though it is a nice refreshing beer I could happily imagine drinking in a beer garden over a Ploughman’s lunch. Next up was the 4.7%ABV Circlemaster, an organic pale ale. Like the Wychcraft this poured amber, although the head failed quicker and left very little lacing on the glass. There was a very faint smell in general from this, touches of grass and hops but otherwise very little to get my nostrils going, almost the same with the taste, yes it was nice, but in a rather bland “at least it is better than most mass produced stuff” sense. In the mouth the overarching feel is of softness with just a touch of bitterness and yes I can imagine it being refreshing, but by the time I got two thirds of the way down it was thin and lacking in flavour, it has no staying power. The best thing about this beer was the label. Leaving behind the lighter beers, it was time to try the Black Wych, described on the label as a “Spell Binding Stout”. I am a big fan of stouts, having been brought up by my eldest brother to think of Guinness as the height of manly drinking – thus it was no surprise that my first ever legal beer was a Guinness. These days I steer clear of the Liffey Water, say it quietly but I prefer Beamish of the mass produced Irish stouts – although I am yet to try the O’Hara Stout, but it is high on my list for stuff to try for my birthday weekend in Ireland. But I digress, back to the idyllic English countryside. Black Wych pours dark, very dark, so dark it is practically opaque – I even put it right up next to a light and couldn’t see through it. The head was the same colour as comes on an espresso in an Italian café, and boy is this stuff thick. The coffee theme continues in the nose, lots and lots of roasted coffee beans, with a subtle burnt chocolate undertone, which almost smothers a burnt caramel twist. I was excited about this one, and the first mouthful didn’t let me down, with the espresso theme of roasted bitterness bursting on to my tongue. However, it wasn’t the “velvety smooth stout” that the label promised, it is very dry, perhaps some oats would have smoothed it out. Not that it was bad, just not what I was expecting. This was a very fine pint, one that would go well with bowls of stew and open fires in the middle of winter. Last but by no means least came the 5.2% Hobgoblin and this was the crowning glory of my evening, although I have to admit that the smell of Mrs Velkyal’s shortbread wafting from the oven put up a brave fight. Pouring it into my 600ml IKEA glass, it was deep red, when held up to the light it was like a fire ruby, and had an ivory head. The smell of this beer was sweet, reminding me of three of my favourite things in life, condensed milk (loved condensed milk sandwiches as a kid), tablet and povidla – the English translation of “plum jam” just doesn’t do povidla justice. On drinking, this was just an explosion of fruit, big juicy amounts of fruit – was about to say buttery but that is most likely the nearly ready cookies Mrs Velkyal is baking. In the mouth this was a wonderfully smooth beer, like liquid jam that had just the barest trace of bitterness. Is it obvious yet that I enjoyed this beer lots and lots? So there we have it, four very good beers all available in Prague at decent prices. On Sunday I bought a joint of pork with the intention of marinading it overnight and roasting it on the Monday, my original intention had been to buy ribs and glaze them with honey, a dark lager and mustard - however, I couldn't find ribs so a roast joint was the replacement. I had already decided on the beer to be used while I was in Pivovarsky Klub on Friday night, having bought a bottle of Chodovar Tmavé Ležák in anticipation. As a side note I should say that I really like the Chodovar range of beers, and when PK had the Skální Polotmavé on tap a few months ago I was in heaven. Preheat oven to 220°C or the equivalent. Place meat and marinade in roasting tray, cover with foil and roast for 1 hour. Feel free to chuck in a bulb of garlic to roast as well. After an hour, remove the foil and continue roasting for 30 minutes. I was hoping for a nice thick sauce to go with the meat, but I had to remove the juices in the pan and reduce them - I think sauce making is something I will have to look into more. Mrs Velkyal and I had this served with just plain rice and she commented that I need to be more assertive with spices, although she liked the beery flavour of the sauce and the fact it had penetrated the meat. So definitely something I will be trying again, although I am certain it could be much better. As for the drop of Chodovar I didn't use in the marinade, it tasted lovely and the bottle will be used in upcoming homebrew projects. I have mentioned in previous posts that I find the highly rated Orval somewhat difficult to get in to, however I have no such problem with the beers from the Abbaye St-Remy in Rochefort. While preparing last night’s dinner of roast pork, marinated in a mixture of honey, mustard, Chodovar Dark Lager and my homemade chilli chutney, I decided to pull out the second of the Trappistes Rochefort I bought at the cheese shop last week, the 8. The Rochefort 8 weighs in at a very respectable 9.2% ABV and pours a wonderful rich dark caramel colour, almost opaque but with a silken quality. So powerful is the aroma of burnt sugar, that even before I put my nose anywhere near the glass I can smell the delights to come. The Rochefort 8 shares the quality of being sweet with undertones of bitterness that was the overriding sensation with the 6, however this one is altogether far smoother. I found that the initial tastes make you want to simply sip the beer, as if in some perverse manner this will help you to savour the flavours. However, after about the third taste, I couldn’t help but taking decent sized mouthfuls to just enjoy the fullness of the beer. Certainly this is a beer that will be taking up more space in my little cellar. My enjoyment of the Rochefort ales makes me wonder about my lack of enjoyment of Orval, perhaps I am doing it wrong, perhaps the shape of the glass was wrong, perhaps I am yet to reach the level where I can truly appreciate the beer. But then perhaps I am just a fairly normal Scot who has a very sweet tooth, if you read the history of beer making in Scotland, it is dominated not by hops, but by the malt. There are no native hops which grow in Scotland, and so the ancient Gaels, Picts and Vikings found other things to chuck in their brews, such as heather and even pine and spruce shoots – traditions which are kept alive to this day. For a drink which has long been the tipple of the masses, the beer world can sometimes be intimidating – in particular when it comes to passing comment on the various ales, lagers, porters, stouts, wheats and myriad others that are available. I sometimes wonder that in trying to turn judging and rating into an objective science, we forget the magic and mystery that is inherent in beer. I like to get out of Prague when I can, whether that be for a weekend or just for a day. This past weekend was the beginning of the year picnic for Mrs Velkyal's school, which this year was held in a village just outside Prague called Průhonice. I usually refuse point blank to go to such events, but in a moment of weakness I said to the wife that I would go with her, especially as we are now married and lots of the parents ask why I don't go to these kinds of things. Also the fact that the picnic was in Průhonice gave me an excuse to visit Pivovar U Bezoušků, so compromise was reached. U Bezoušků is right in the heart of Průhonice, next to the castle and park which are the village's main tourist attractions, and yes they are nice and make a lovely wander around for an hour or so. In possibly the finest application of the "location, location, location" mantra, it is also right opposite the bus stop back into Prague itself. Saturday was a very hot day and so we were planning to sit outside, but with a barbecue belching smoke all over the place we thought that the ambience of sitting next to the lovely coppers could not be bettered, I instantly fell in love with the place; no smoke (either from barbecue or other drinkers) and some fun paintings on the wall. I have mentioned before that religion and beer making have a long and illustruous career together, so I enjoyed the irony of the beer making process being painted to resemble the Stations of the Cross - drink enough beer though and they should add an extra picture and call it the "Station of the Cross Wife". And drinking excess amounts of beer would be very easy at U Bezoušků. 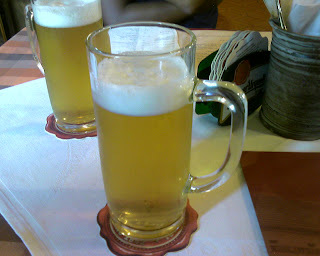 Generally speaking I drink 12º and higher beers, but the standard lager here was a 10º. I can't remember the last time I enjoyed a desitka as much, if I was revelling in the ten, their 16º came close to overload. The 16º is a polotmave which is nice and malty with a sweet undertone, unfortunately it came in 0.4l glasses rather than the full half litre, but thoroughly enjoyable it was too. While we were at the picnic a few of the parents who live in Průhonice told us that while the beer was good, the food left much to be desired. As is traditional, a few beers make a man hungry and so we ended up ordering a few little snacks to go with the beer, in this case we had a homemade klobasa (I know the dictionary translates that as "sausage" but it does it no justice) which was baked in dark beer and a side order of bramboraky (potato pancakes). Both were quite good, and went perfectly with the beer, so that by the time we crossed the street and caught the bus into Prague we were well satisified. Beer hero of the week. I have decided that each week, or rather each week I remember, I am going to post comments from various beer blogs, brewery websites and the like which I find worthwhile. I spend quite a bit of time looking at the websites of the smaller breweries around the world, working out how to get hold of their wares, for example I am going to Oxford in a few weeks and plan to have a few cases of ales shipped to my brother's house for consumption. This week's Beer Hero of the Week is the Colonsay Brewery. Possibly because Colonsay is not so far from home but most likely because I just like the way these guys think, but I will be ordering a mixed case of beers to be savoured, and maybe one or two will find their way to Prague. "Our brewery is known in the trade as a five barrel plant and produces 1700 pints during each cycle. Note the use of the word PINT. Call us old fashioned but we are committed to pints. The day people go into a Highland bar and ask for a quarter litre of beer and a 35 ml malt to chase it down is the day this brewery will be converted to the production of seaweed soup. We are a nation of beer drinks and we want a pint – not some short measure of half a litre or nonsense like that." I think it is fairly obvious by now that I am not a big fan of Klaster. I do however try to keep an open mind and so when Pivni Filosof commented that he really likes Klaster I decided that I should make an effort to go beyond the 12º on which I had based my views. Thus last night doing the shopping I noticed Klaster for sale, and I bought a bottle of their 11º - at the insane price of 12kc, which works out at about 40p for British readers, or $0.70 for the Americans, and the Europeans have it at €0.50. Having chilled the bottle thoroughly, I poured it into Mrs Velkyal's Pilsner Urquell glass and got very little head - I don't know whether it is my pouring technique, the glass or the beer but with Klaster I always get a pants head - and I am of the opinion that a properly poured lager should have plenty of foamy joy. So it was I took my first mouthful, and I was shocked that I quite liked it and I commented to Mrs Velkyal that perhaps I had misjudged Klaster, ok it is never going to be a regular drink I thought but it isn't that bad. However I was to be ultimately disappointed, as the drink wore on it became just another half decent lager - not one I would go out of my way to drink. By the time I got to the very end of the drink it had become decidedly soapy and I was once again left with a deflated feeling. When I mentioned to Mrs Velkyal that I just didn't enjoy Klaster beers she reminded me that on our trip to the Eggenberg Brewery in Český Krumlov I wasn't too enamored with the pale lagers they produce, only to really enjoy their dark lager. So next I must hunt out a Klaster Tmave and continue the research. As a result of an entry on Evan Rail's Beer Culture blog, as I have previously referred to, I tottered off to a local cheese shop recently in order to buy beer. I literally tottered as it was just round the corner from Pivovarsky Klub so I had stopped in for a quick pint, with became a rather chatty 4 pints and a meal. I had decided it was time to finally try some of the Trappist ales from Belgium. On my first foray to the cheese shop I bought myself an Orval and a Rochefort 6, there was a second excursion a couple of days later because Mrs Velkyal had eaten most of the farmhouse cheddar I bought the first time and so we needed supplies, and I bought another Orval as well as a Rochefort 8 and 10. Wanting to get as much as possible from these beers, I didn't open them that evening, I decided to do some background reading. 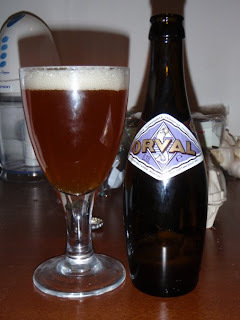 Thus it was on Tuesday evening I decided to pop open the Orval, and this is what I got from the bottle. "I fear I am about to commit beer heresy by admitting to not really enjoying this one all that much. The beer was bottled on the 31 May 2007 and as such was 14 months old when I drank it.It poured a very nice copper colour, and was of course cloudy - as a personal opinion this is a good thing, as I like beer unfiltered and unpastuerised. There was a fluffy head which dissipated slowly, and was gone within five minutes. On the nose were distinctly citrus notes. The first taste was a shock to be honest. This will sound odd, but it tasted fizzy, rather tart and almost like popping candy on the tongue.It wasn't awful, just not what I was expecting - so I will of course have another one to further hone my opinion." As of yet the second bottle hasn't been opened. I love that colour! It reminded me of the peat back at home in the Outer Hebrides, and I am sure there was a slight tinge of peat on the nose as well. After the fizz bang of Orval I was unsure of what to expect. The first taste of this was wonderfully smooth with a sweetness which reminded me of caramel. Eventually this gave way to dark chocolate, without wanting to sound like Jilly Goolden, it actually put me in mind of the organic dark chocolate from Marks and Spencer. As I say it is a nice smooth ale, with just enough zing to avoid it being cloying in the mouth, and the more I drank the more the chocolate was replaced by cocoa. Overall I really enjoyed this one, and am looking forward to trying the more potent 8 and 10. On my way home from work last night I got a message from Mrs Velkyal simply saying, "what is for dinner?" - marvellous, I though to myself, I can make a meal with beer. But what to make, and which beer to use? In the end I decided to keep it simple and make an ale goulash, using Primator's English Pale Ale as the beer - pretty much my only choice. Although the recipe I concocted in my head only called for a single 330ml bottle of ale, I bought 4 because I knew that Mrs Velkyal had endured a difficult day with her children - she has about 15 of them between 3 and 6 at her school - and no doubt she would enjoy a beer to unwind with. Plus a few brownie points are always useful. So here are the ingredients that went into the goulash - when I took the picture above I was planning a beef and ale stew, but it changed, and the carrots and tin of tomatoes didn't get used. My dad is from Chiswick - making his local brewer the wonderful Fullers, which is ironic in a way as they have long been a favourite of mine. My mother is from Fraserburgh in the north of Scotland, home to Brew Dog Beer. My eldest brother lives in Kent, home of great hops, and of course Shepherd Neame. My elder brother lives in Bicester, near Oxford and not too far from the Hook Norton Brewery - one of the few remaining tower breweries in the UK. My wee brother lives in Alness, in the far north of Scotland, and just up the road from the Black Isle Brewery. My wife is from South Carolina, the first Confederate state to secede from the Union and where you will find Thomas Creek beers. I spent most of my childhood in the Hebrides, and there you will find the Isle of Skye Brewing Company. At university in Birmingham I knew no better so I drank Caffrey's mostly, in various O'Neill's pubs - usually on Broad Street. Most of my adult life has been in Prague........I guess this is what the blog is about at the moment. The drink that changed my relationship to beer? Bishop's Finger from Shepherd Neame. I saw the sign below at the Eggenberg Brewery in Český Krumlov and found it very interesting. For those of you who don't have any German it says "Budweiser from the Original Source", just as Pilsner Urquell is "Pilsner from the Original Source". 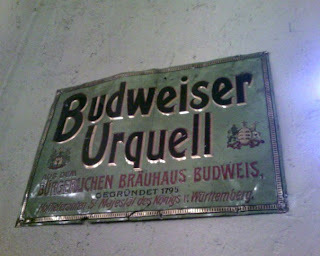 The sign goes on to state that this "Budweiser Urquell" is brewed at the Burgers' Brewery in Budweis, which is the German name for the modern city of České Budějovice. The Burgers' Brewery in Budweis, according to the sign was founded in 1795, some 60 years before the Bavarian Brewing Company was founded in the US - it was this brewery that would become Anheuser-Busch. Indeed the Burger's Brewery in Budweis, which is today the Budějovický měšťanský Pivovar - "Town Brewery of Budweis", is 100 years older than the makers of Budvar. By the time the Bavarian Brewing Company had been renamed in 1860 the Burger's Brewery of Budweis had been selling under the brand name "Budweiser Bier" for over half a century. According to Shakespeare, a rose by any other name would smell as sweet - the converse must also be true, call a beer made with rice what you will, it won't change the fact that it is dish water. Mrs Velkyal and I are both avid foodies - there is a reason for the "velky" in Velkyal, it is the Czech word for "big", and at 6'4" and 240lbs, I am certainly never going to audition well for the role of Tinkerbell. In the past few weeks we have been playing around with all manner of recipes and dishes; being from the South of the US, Mrs Velkyal loves making southern foods, in particular biscuits. Last weekend I made my first foray in the world of goulash - a nice spicy beef stew which we polished off even though I had sworn blind I was going to take the remains for my lunch the next day. Also recent additions to the Velkyal household larder, also known as the windowsill, have been various chutneys, quite a few cakes and lots of plans. Not wanting to be outdone by the ever graceful and talented Mrs Velkyal I put my thinking hat on and decided it was time to find out what I can do with Czech beers in food. Most of plans involve using the beers from Primator, but I will be keeping an eye on the taps at Pivovarsky Klub and pondering what options they give me. One thing I will be doing this week is a variation on Beef Guinness using instead the wonderful 19° porter from the Perstejn brewery in Pardubice, also on the drawing board will be a steak and ale pie using Primator's English Pale Ale - assuming Mrs Velkyal hasn't drunk the entire national reserve. Of course the scope for using beer in food is limited only to your imagination and how well you can match the flavours of the food with the flavours in the beer, for example I have just discovered a recipe for an ale chutney, for which I will bring a bottle or two of ale back from the UK when I am there in October.